The presence of God and the Lordship of Jesus in meetings. The cross is in the very midst of revival. Now why is the cross in the very midst of revival? If we look at what we consider to be classic revivals, in the great awakening we see Jonathan Edwards and he preaches his very famous sermon ” Sinners in the hands of an angry God.” And as a result we see people in the midst of tremendous conviction poured out by the Spirit. Now, is this the formula for revival? Must we preach about sinners in the hands of an angry God? Do we just have to repeat Jonathon Edwards sermon and we will see revival? We would just stand up and preach verbatim the words of that sermon and then we would see revival, and obviously that is not the case. So the cross in the midst of revival. What is the cross, what does it represent? What does it mean? Why is it the central theme and focus of Christianity? Well the symbolic part of the cross was that mercy and judgement were mysteriously entwined together. Judgement for all those who reject Gods plan, and mercy for those who would embrace His Son and the sacrifice offered on Calvary, a sin offering for the world. The sins of the world, the guilt of the world would be judged on Calvary. And so we see mercy and judgment , mysteriously entwined together on the cross of Calvary. In the Hebridean revival we see men so affected by the Spirit of God poured out that they cry ” Is there mercy for me, is there mercy for me?” It was a cry from the deepest wells of mens hearts. 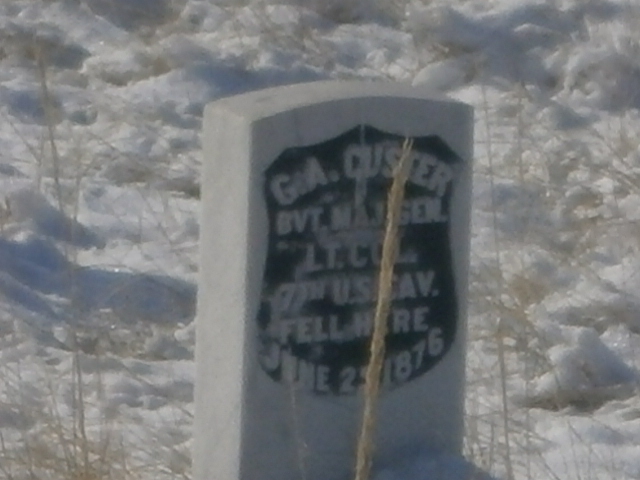 The attached photo marks the spot where General George Armstrong Custer fell at the Battle of the Little Bighorn in 1876, which I photographed during a trip late last year to the battlefield. It was impressed upon me during this visit how vitally important it is to get those important strategic decisions right in our own life and indeed within the corporate life of the church, assuming we want the things in place in our lives that Christ wants. This rests in our ability, both individually and corporately, to “see the bigger picture”. Sadly, whilst occasionally talking about the bigger picture, the church consistently fails to stay on any course which will actually lead her in the direction of Christ Himself. You see, the single most critical strategic work of the Holy Spirit in these days is the preparation of the Bride of Christ and for the church to come into the fullness of the stature of Christ. This is the bigger picture. The desire of Jesus to have a pure and spotless Bride is His overriding and all-consuming passion. It super-cedes every other work and process. Everything we do should be geared towards this.